Caption : HYDERABAD: Mood tells it all: CPI(M) State Secretary B.V.Raghavulu refusing to call off the indefinite hunger strike in Hyderabad on February 26, 2007. 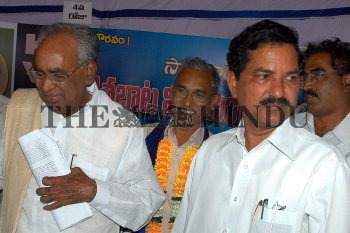 Ministers K.Ranga Rao and Marreppa failed to convince the leader. Photo: H. Satish .